You may get error of different version instead of 4.5 according to your configuration. So to register framework in IIS, run the following command in command window. This installed ASP.NET version v4.0.30319 at the specified application root and its subfolders. All existing script maps in the specified path and below were updated. In the root folder, create a new blank file called TestHelper.cshtml. To call the helper you created, use @ followed by the file name where the helper is, a dot, and then the helper name. (If you had multiple folders in the App_Code folder, you could use the syntax @FolderName.FileName.HelperName to call your helper within any nested folder level). The text that you add in quotation marks within the parentheses is the text that the helper will display as part of the note in the web page. Save the page and run it in a browser. 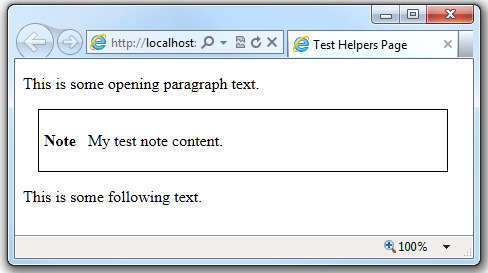 The helper generates the note item right where you called the helper: between the two paragraphs.